The results of the study confirm the globalization trend in the examined industry sectors that has persisted for years. Furthermore, GEXSO observed an animated internationalization with an increased focus on supply chain activities in East European and Asian regions. This development has been confirmed by leading economists and industry experts for some time now. GEXSO examines the status quo of globalization based on various company key figures within the different industries: automotive suppliers, machinery and plant engineering, and industry component manufacturers. We analyze global procurement, production and sales activities for companies in Germany, Austria and Switzerland. According to the number of active suppliers, GEXSO classifies the participating companies into five categories: up to 500, up to 1,000, up to 5,000, up to 10,000 and more than 10,000 suppliers. When comparing all three different sectors, 61.4 per cent of the interviewed companies count less than 1,000 suppliers as their active business partners. 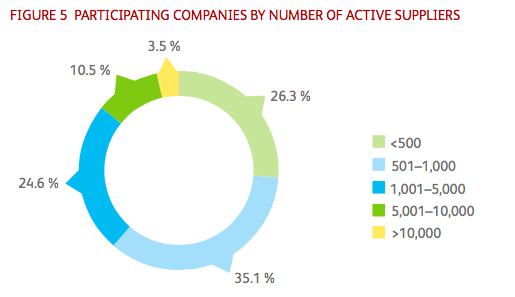 More than a third of the participants state that they cooperate with 500 to 1,000 active suppliers. Participants from the automotive supplier industry state that they work with even less suppliers: 66.7 per cent maintain less than 1,000 active business relations. Generally, the supplier networks of all three industries strongly focus on Western Europe. Currently, 65.6 per cent of the participating companies’ active business comes from this region. Particularly companies from the machinery and plant engineering sector maintain supplier networks that are centralized in Western Europe. 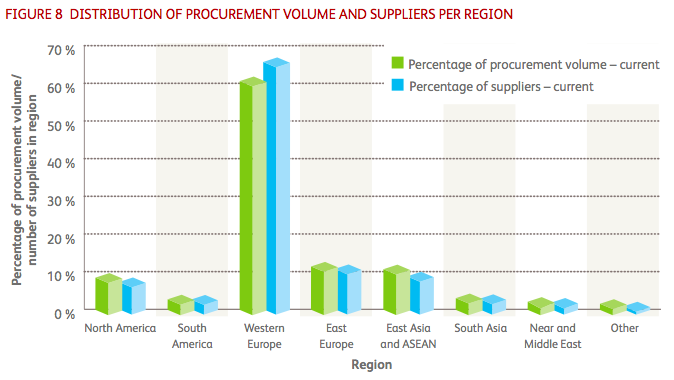 Apart from Western Europe; East Europe, East Asia and North America are important procurement regions for the examined industries – 7.2 to 10.6 per cent of active suppliers come from those three regions. The importance of the North American region is in comparable favor across all industries although especially through supplier relationships with companies in the automotive supply industry. Therefore, the regional structure of supplier networks is already strongly diverse today. This trend will continue with strong dynamics within the next five years. The participants of the study expect a regional shift of 8.2 per cent of their supplier relations. The importance of Western Europe as a region for procurement is expected to decrease drastically. In five years, the companies plan to maintain supplier relations with only 57.4 per cent of all suppliers from Western Europe. While a decline is exclusively expected in Western Europe, there will be an increase of active supplier relations in all other examined regions. At least half of the new suppliers will be sought for in East Europe and East Asia. 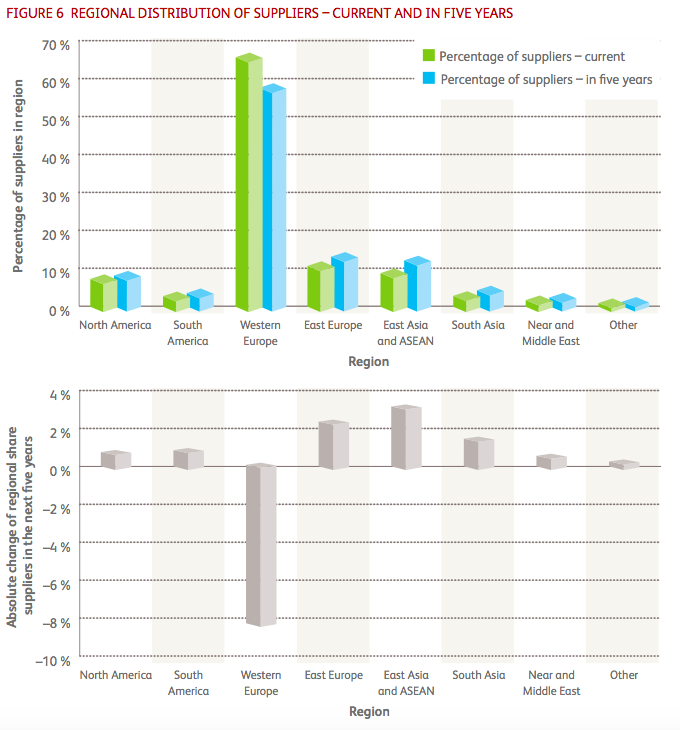 An increase of 2 per cent of the relative proportion of suppliers is expected in both regions. Therefore, besides Western Europe, they will be the most important regions for procurement: 12.8 per cent of active suppliers will be located in East Europe and 11.8 per cent in East Asia. While the automotive supplier industry will focus more on the expansion of supplier relations in East Asia, companies from the machinery and plant engineering sector as well as the component manufacturing industry mainly plan to build new supplier relationships in East Europe. The regional distribution of procurement volume is currently also concentrated in Western Europe. An industry average of 60.6 per cent is assigned to Western Europe. Similar to the supplier network, besides Western Europe, East Europe, East Asia and North America are the most important regions. 8.4 per cent to 11.3 per cent of the total procurement volume is currently located in these three regions. 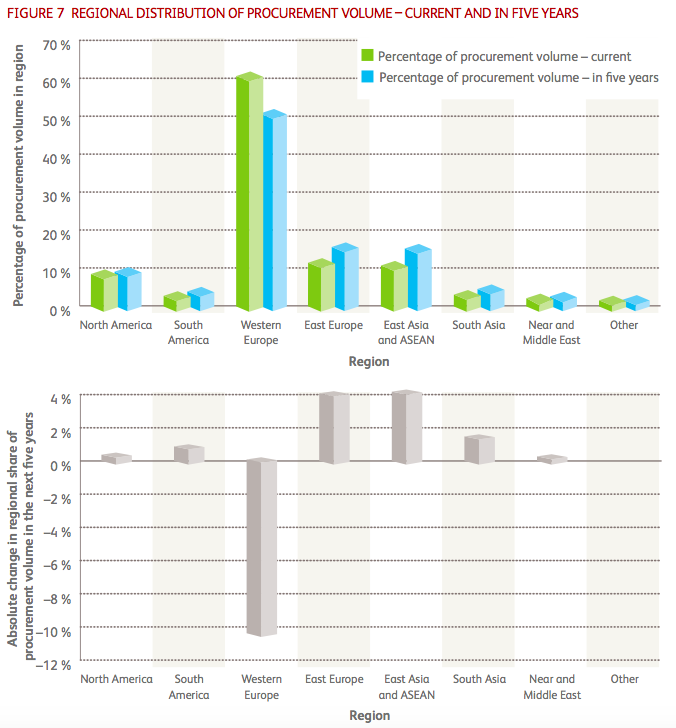 The cumulated volume of all three regions is a third of the global procurement volume. Generally, the results of the study depict a strong global distribution and therefore an advanced globalization of procurement activities in the examined industries. Compared with the structure of the companies’ supplier networks, the regional distribution of procurement volume will change even more dynamically in the next five years: the companies plan a 10 per cent reduction of the proportion of procurement in Western Europe from 60.6 per cent to approximately 50.3 per cent. Therefore, the results of the study signalize an important step in the development of companies from Western Europe in the examined industries: in five years they will only cover approximately half of their procurement volume in Western Europe. East Europe and East Asia will be the winners of this development. The relative proportion of procurement volume will increase by 4 per cent in both regions (from approximately 11 per cent to 15 per cent). 80 per cent of the reduced procurement volume in Western Europe will be shifted to these regions. Therefore, a third of the total procurement volume will be located in East Asia and East Europe within five years. However, sector-specific growth strategies can be observed: While the automotive supplier industry plans to increase their proportionate procurement volume mainly in East Asia, companies from the machinery and plant engineering sector and the industry component industry mainly concentrate on a proportionate growth in East Europe. Generally, the apparent convergence of the development of supplier structures and procurement volume can be explained by the results of the study. The procurement activities of the companies from the different examined industry sectors are already very global today. This development will intensify further in the next five years. While Western Europe will lose its importance as a region for procurement, an increasing amount of procurement activities will shift to East Europe and East Asia. Currently, 60.6 per cent of the global procurement volume are located in Western Europe, while at least 65.6 per cent of the active suppliers still come from this region. Therefore, a relatively small proportion of procurement volume is distributed amongst a large number of suppliers. A contrary relation can be observed in the next important three succeeding regions, East Europe, East Asia and North America. Here, a relatively large proportion of the procurement volume is distributed amongst a relatively small number of suppliers. 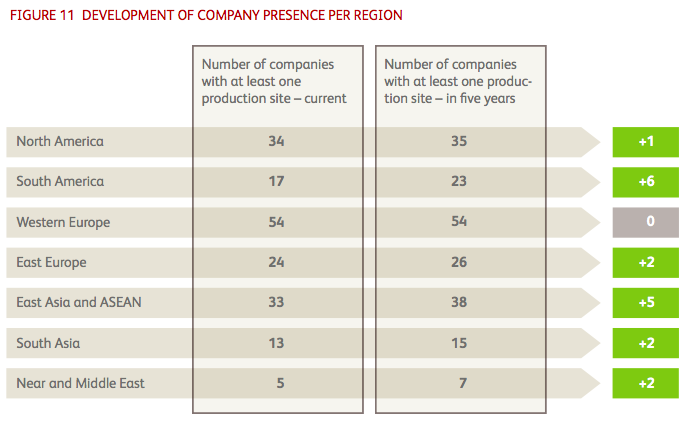 Only 41.2 of all production sites of the interviewed companies are located in Western Europe. Therefore, the results of the study already depict a very global production infrastructure today. The sector-specific results of the survey show an even more centralized picture of the production of industrial components manufacturers. In this sector, 53 per cent of all production sites are currently located in Western Europe. In contrast, the automotive supplier industry produces very decentralized, with only 35.3 per cent of production sites located in Western Europe. Apart from Western Europe, North America (18.9 per cent) and East Asia (15.4 per cent) are also important regions for production. Compared to the procurement activities of the companies, their regional diversification of production sites is further advanced. This trend will continue to be observed within the coming years. The participants of the study plan to shift a total of 3.5 per cent of their production sites. A decline in production activities is expected in Western Europe, North America and the Middle East. Thus, the paradigm shift within the production networks of the examined industries will continue. The traditional industrial regions will continue to lose importance. 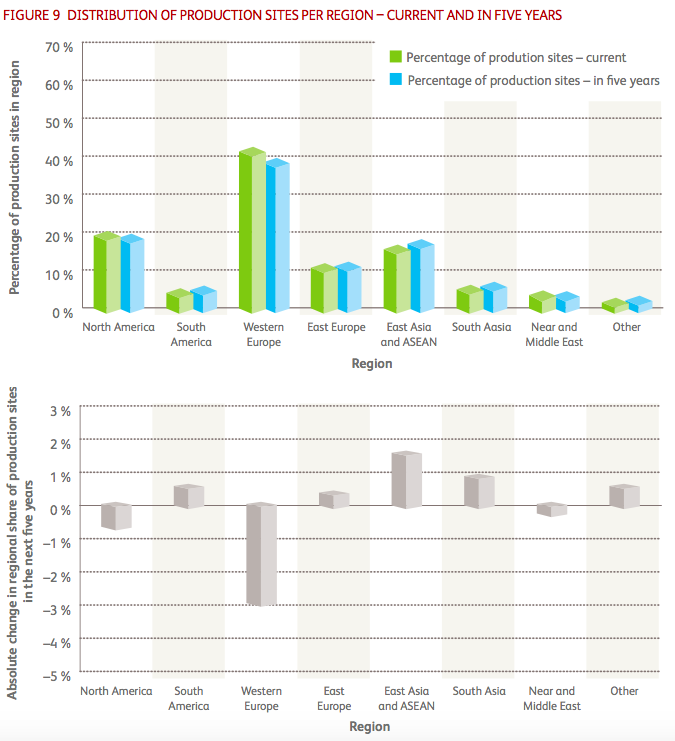 The winners of the global shift of production capacities will be East Asia and South Asia. In five years, at least 16.9 per cent of all production sites will be located in East Asia and 5.7 per cent in South Asia. Thus, 22.6 per cent of all production sites will be located in the Asian region. The examined industry sectors pursue different growth strategies. 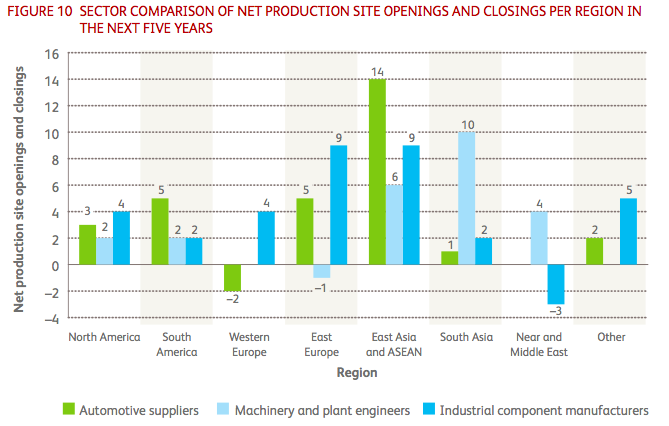 Companies in the automotive supplier industry increasingly invest in new production sites in East Asia: 14 production site openings (net amount) are predicted within the next 5 years. The machinery and plant engineering sector only plans six new production sites (net amount) in this region, whereas they plan a net increase of ten new production sites in South Asia. The industry component manufacturing sector’s focus on Europe is also evident in their forward planning. The companies will globalize their production in East Europe and East Asia with nine new production sites (net amount) respectively. GEXSO examined the global presence of the participating companies. Companies are regarded as present in a certain region if at least one of their production sites is located there. The results of the study show that the interviewed companies have a strong global presence. Production sites exist in all examined regions, although the number of companies that are represented in a region varies drastically. As expected, most companies are located in the home region Western Europe. However, the intensity of their presence will stagnate in the next five years while companies in other regions increasingly plan new production sites. As measured by company presence, Western Europe, East Asia and North America are the most important regions worldwide. There will be a slight increase of global production sites in all regions within the next five years. However, South America and East Asia are particularly important for the development of company presence. According to the results of the study, 17 of the examined companies currently operate at least one production site in South America, 24 in East Europe and 33 in East Asia. In the coming years these numbers will increase to 23 in South America, 26 in East Europe and 38 in East Asia. This is an increase of 35 per cent in South America and 15 per cent in East Europe and East Asia respectively. The companies also expect a relatively large growth of company presence in the Middle East. However, the number of companies that are located in this region will still be comparatively small. The companies interviewed by GEXSO currently operate 1,004 production sites worldwide. Additionally, they plan to open 102 production sites and close 19 production sites in the next five years. Thus, the number of production sites will increase to 83 in the next five years. Nearly a third of this net growth will be in East Asia, where 29 new sites are planned. The high growth rates in East Asia confirm that this region is now an indispensable production location for Western European companies. The next highest capacity increase is planned in East Europe. The participants of the study plan to build 14 new production sites and close only one production site in this region. Therefore, there will be a net capacity increase of 13 production sites. The same growth rate is predicted in South Asia, where the companies only plan to open production sites. Equally, there are 13 new production sites planned in Western Europe. However, these will be nearly neutralized by eleven production site closings. The current regional distribution of customers reveals that there is a strong focus on Western Europe. Industry-wide, an average of 51.1 per cent of all customers are located here. 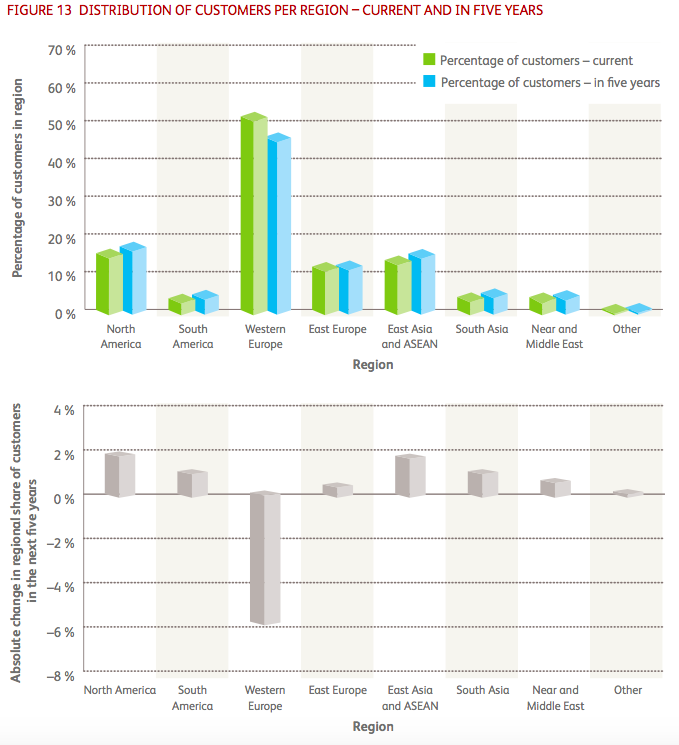 North America (14.8 per cent), East Asia (13 per cent) and East Europe (11.3 per cent) are also important customer locations. Generally, the results of the survey demonstrate that the customer structure is very diverse, which indicate a well-advanced globalization of sales activities in the examined industry sectors. This trend will continue in the future. On average, the companies of all included industries expect a regional shift of nearly 5.7 per cent of their customers in the next five years, whereby the number of customers located in Western Europe will decrease. On the contrary, an increase of sales activities is expected in North America and East Asia with a growth of 1.7 or 1.6 per cent. Therefore, the results of the study indicate that there will be an even stronger global distribution of customer relations in the next five years. The importance of North America is particularly interesting for the examined industry sectors. Considering customer relations this region is already the second most important for the participating companies and in addition to East Asia, it will also be the most important region for growth in the next five years. The results of the study demonstrate the relatively great significance of North America for the sales markets.